Now some of you might agree with what I am about to say and some of you probably won’t but as always I would like to hear your comments below. Last season Aaron Lennon was nothing short of amazing for us, teams were having to double up on him in an attempt to keep him quiet. All was going well until his injury which kept him out for a few months. Since coming back towards the end of last season he has not been the same player. He had a poor World Cup and still hasn’t been as good as he was last season for us. Lennon seems to be lacking confidence in taking on players, something that used to come to him naturally but this season he seems to be looking for the simple pass. I have heard some fans say that at the moment Lennon is cheating in the Tottenham team and not pulling his weight, he only seems to be interested if he has the ball at his feet. It is a mixture of these things which has seen Redknapp drop him to the bench in recent weeks, a player that was once a dead cert to start now has genuine concerns of being left on the bench. There is one thing that has come out of this and I would love to hear if anyone else has noticed this or if it’s just me being deluded. I have noticed that his crossing seems to have improved, maybe because he is not running at pace so much which means he has more control over his crosses. He has put in a few lovely crosses for Crouch recently and put in an absolute peach the other day. Also his crossing with his left foot seems to have improved no ends as well, he seems unfazed on whether the ball is on his right or left. So a few negatives and a positive in my book, but for me I want Lennon to be the player he was for most of last season, because now we have Bale on the left if Lennon could rediscover his true form then teams would really fear us. Tottenham shot stopper Heurelho Gomes has tipped the club to go on a strong run in the Champions League this season. Spurs are well placed in their group on 4 points from 2 games but face two tough games away and at home to holders Inter Milan. The 29-year-old was also asked how the squad at Spurs compares to the one at PSV five years ago. Spurs are playing in their debut season in the Champions League and started with a 2-2 draw away to Werder Bremen followed by a 4-1 demolition of FC Twente at home. Next week will see the team travel to the San Siro to face champions Inter Milan and Gomes is full of confidence that Tottenham can pull off a shock. Remember to watch the match live click the forum link at the bottom or top of the page and log in or sign up. With kick off just moments away we bring you the starting XI from both teams. Harry has gone for 4-4-2 but Ledley King hasn’t managed to be fit for the game, it looks as though Tom Huddlestone will be playing at the back with Bassong, oh dear how unlucky are we with injuries that we have to play one of our best midfielders at the back. I don’t know about anyone else but it doesn’t seem like the best move loaning out Caulker now, maybe we should have held on to him for another month. If we are going to win the match then we will have to win the battle of midfield, we have our strongest midfield on the pitch except Hudd who is at the back, how will he cope there, last time he was asked to play there he did ok, nothing special but he done a half decent job. The back four will be our main concern and I am sure Villa will be looking to exploit it. Bit of a strange selection, Corluka is on the bench and surely he would have been obvious choice for center half, I am guessing that Harry has been spending a lot of time this week training with Huddlestone at the back. Have We Used The Olympic Stadium To Get What We Want? Random "Triffic" Blogs Comments Off on Have We Used The Olympic Stadium To Get What We Want? OK so the new White Hart Lane development plans have now been approved by the Council which leaves Boris Johnson two weeks to also approve things, so my question is why are we still being linked with the Olympic Stadium? I have a couple of possibilities in mind. It’ll be to act as pressure for the Mayor of London and the Secretary of State to approve the development of WHL. Everyone knows that the Tottenham area is in desperate need of redevelopment and if they think for a second that Spurs will move to a different venue then they will approve it. Nobody else is willing to pump millions into the local community. Spurs are just “encouraging” them to make their decision more quickly. I don’t for one minute think we’ll move to the Olympic Stadium. The bid for the Olmypic Stadium could be there for back-up should Tottenham not get the full approval needed to start redevloping White Hart Lane which would then give us the option of moving to the Olympic Stadium should we win the bid. I don’t think this is our intention, I fully believe that making White Hart Lane into an almost 60,000 seater stadium is the number one goal here. It could just be another masterstroke by Daniel Levy by putting pressure on the council to approve plans, it has taken months to get the council to approve it and to me it’s no coincidence that the day we are linked with making a bid for the Olympic Stadium that Haringey Council unanimously vote in favour of Spurs being able to redevelop White Hart Lane. Of course we can’t rule out the possibility that the board actually do want the Olmypic Stadium to be our new home ground, they might see this as the cheaper option although I don’t think they will ever have the backing of the fans should they decide to push ahead with the idea. If anyone is interested in becoming a Tottenham blogger for Triffic Tottenham we need a new writer, click the contact page and use the contact me form. Thanks. Rafael Van der Vaart may well be suspended for the Champions League clash between Inter and Spurs but that hasn’t stopped him taunting his Dutch Pal Wesley Sneijder by text message ahead of the big game. “Wesley is a good friend of mine. We talk a lot and I was looking forward to playing against him. “I am going to miss playing – but I might be sending Wesley some texts before the game. Sneijder and Van der Vaart played in the World Cup Final together in the summer for Holland but were beaten by Spain, both players are good friends and both thought of very highly in their homeland. Tottenham v Aston Villa Live!! Random "Triffic" Blogs Comments Off on Tottenham v Aston Villa Live!! To watch live today at 3pm click the link at the bottom of the article for the forum. Nothing less than a win today please Harry, after last week’s result against The Hammers we can’t afford another slip up, not even a draw is good enough today. Due to Spurs injury worries at the back Ledley King may play two games in a week should he tell the Spurs boss he is up to the task, if King does feel he can handle another game he will be joined by Bassong at the back. I would expect Hutton to play right and BAE on the left which will free up Bale for the left mid spot. Should King not be able to play then Corluka will join Bassong at the back. Jermain Defoe, Michael Dawson, Jamie O’Hara and Jonathan Woodgate are still all long term casualties although Michael Dawson may return to training by the end of the month to boos Harry’s options at the back. Aston Villa have Richard Dunne back in contention for today but Gabriel Agbonlahor is still injured. Houllier has taken the reigns at Villa Park and the players will be keen to impress the new boss so Spurs will have to be on top form to earn their three points. Tottenham Squad: Gomes, Cudicini, King, Hutton, Bale, Bassong, Corluka, Jenas, Assou-Ekotto, Huddlestone, Lennon, Palacios, Sandro, Kranjcar, Bentley, Modric, Van der Vaart, Dos Santos, Crouch, Keane, Pavyluchenko, Pletikosa. Aston Villa Squad: Friedel, L Young, Dunne, Collins, Cuellar, Warnock, Albrighton, Petrov, Reo-Coker, Downing, A Young, Heskey, Guzan, Clark, Ireland, Davies, Bannan, Carew, Agbonlahor, Delfouneso. To watch the match via streams log into the >>Forum<< or sign up if you have never done so before, there you will find streams and details on how to watch. 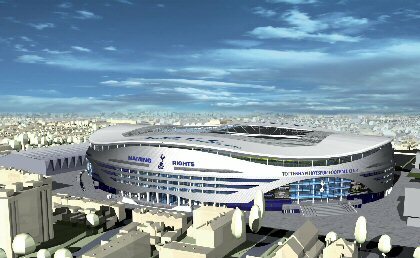 Finally after months of debate Haringey Council had a final meeting to decide whether or not to give Tottenham the go ahead to redevelop White Hart Lane into a new 60,000 capacity stadium, council members voted unanimously in favour of Tottenham redeveloping White Hart Lane. Watching the live webcast on the Haringey Council website the points were discussed and it seemed as though a lot of the council members were concerned with Spurs being linked with a bid for the London Olympic Stadium, the meeting finally finished around 11pm tonight in which the members voted in favour of giving Tottenham the go ahead. Just by looking at comments from others who were watching like myself they seem to have picked up that the Council seemed worried that Tottenham were set to bid for the Olmypic Stadium and this could well have worked in Tottenham’s favour when the voting process began. Tottenham will still have to overcome one or two more hurdles but with the biggest obstacle would be getting permission from Haringey Council but with the council on their side it looks as though things can now finally begin to move forward. A Tottenham spokes person was also asked to comment on whether Tottenham had in fact made a bid for the Olympic Stadium but refused to comment on the matter, fueling speculation that there may be truth in the rumor, it now looks as though Spurs won’t actually need to bid for the Olympic Stadium afterall. The final part of the application is in the hands of Mayor of London, Boris Johnson who now has 2 weeks to rubber stamp the approval for Tottenham to press ahead with the new £400 million stadium. Council leader Claire Kober said: “The Spurs development has the potential to make a huge impact, not just on the success of the football club, but also on the whole of Tottenham – delivering job opportunities, regenerating the area, and boosting the local economy. “We’re proud of Spurs’ rich history in Haringey and excited that the club has committed its future to the area. Tottenham Bid For Olympic Stadium? Tottenham and AEG, the American operator of the O2 Arena, have teamed up to mount a surprise joint bid to lease the London Olympic Stadium after 2012. The bid was submitted on Thursday, the deadline for applications and the same day that the Premier League club was due to hear whether its plans to redevelop its existing White Hart Lane ground in north London had been approved by the local planning authority, Haringey council. Tottenham had been sniffing around an Olympic stadium application for some months and it’s joint bid may be seen by the council as a tactical lever in the club’s protracted White Hart Lane redevelopment negotiations. Given the huge amount of time and money the club has invested in these plans, staying in Tottenham remains the club’s priority. But even if the council approves the scheme, the club must still overcome several hurdles, including approval from the London mayor and the government. It must also raise about £250m for the scheme. The Tottenham-AEG bid for the Olympic stadium, said by a club insider to be “a sensible back-up option” to White Hart Lane redevelopment, means the Olympic Park Legacy Company (OPLC) – the government agency responsible for the post-2012 future of Olympic venues – has rival and similar-looking applications from Premier League clubs to consider. West Ham United, which regards itself as the obvious choice of tenant because of the proximity of its existing Upton Park stadium to the Olympic Park, has the backing of Newham council. Tottenham and AEG’s plans involve converting the 80,000 Olympic stadium into a 60,000-seater venue for football, as does West Ham’s application. AEG, the Los Angeles-based sports and entertainment business, would manage the venue, including arranging naming rights and premium seating and other stadium uses including concerts and athletics. Each of the Premier League clubs’ offers have pros and cons. While West Ham would be able to point to local backing, it has debts of nearly £100m and is struggling to bring in new investors. Tottenham, owned by billionaire currency trader Joe Lewis and chief executive Daniel Levy, reported a £33.4m pre-tax profit for 2008-09 and the partnership with AEG may give the OPLC greater comfort about the viability of the £550m stadium beyond 2012. The Olympic stadium conversion costs are in the region of £150m. Although West Ham discussed a joint bid with AEG, the two sides failed to reach agreement because of “personality issues”, said one person familiar with the talks. But the OPLC intends to sign a lease agreement by the beginning of next April and, given Tottenham’s ongoing redevelopment plans, it will need to establish just how serious the club is about taking up the Olympic stadium lease. Although the OPLC is at arms length from the London 2012 organisers, AEG is well known to Olmpic officials. The O2 will be the venue for Olympic gymnastic events and the basketball finals and will be rebranded the North Greenwich Arena for the Games. Tottenham also has London 2012 links. Sir Keith Mills, who was chief executive of the London 2012 bid and is deputy chairman of the London organising committee, is on the Spurs board. AEG and Tottenham declined to comment. So are we really keen on a move to the Olympic Stadium or are we just keeping our options open? West Ham remain fim favourites to land the Stadium after the 2012 games and as a Tottenham fan I would hope that there is no chance in hell that we would get it, it would mean relocation and in turn moving from White Hart Lane which would kill part of our history. I think that there may be truth in this but I also believe that it is a backup plan in case there are any problems with the proposed redevelopment of White Hart Lane, even if we did have to play at the Olympic Stadium then it would may well be temporary until White Hart Lane is complete even though the current plans allow for us to stay at the Lane while work is underway. The deadline for any bid to take over the stadium after the games was today (30th September). Credit to The Financial Times for most the article. Talking to Spurs TV, Rafael Van der Vaart says we have one of the best squads in Europe and declares he is really looking forward to playing for the club. He sounds just like Martin Jol which makes me love him even more. Roll on Saturday where hopefully we will get to see him in action. Following his first training session with the club gave an interview for Spurs TV where he speaks of his ambition.